With an assist from President Trump, James Comey's book is surging on the best sellers list. The book, "A Higher Loyalty: Truth, Lies, and Leadership," won't be released until April 17. But on Sunday it was No.1 on Amazon's constantly updated list of best sellers. The ranking reflects a sudden spike in pre-orders. On Saturday morning, it was No. 15. What caused the spike in the former FBI director's book sales? Well it seems to be related to the president's rhetoric. Trump's decision to fire Comey last May, triggering a special counsel investigation, is back in the news this weekend, thanks in part to deputy FBI director Andrew McCabe's firing on Friday night. On Saturday, Trump celebrated McCabe's firing and called out Comey as "sanctimonious." Trump said Comey "made McCabe look like a choirboy." Comey responded later in the day with a tweet. "Mr. President, the American people will hear my story very soon. 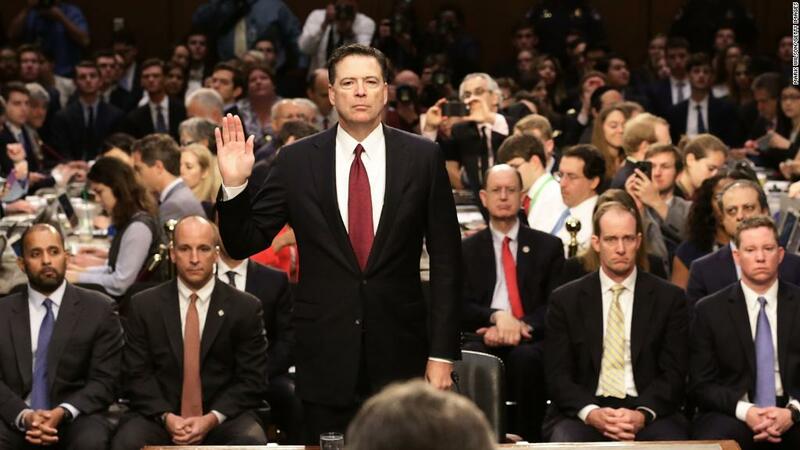 And they can judge for themselves who is honorable and who is not," Comey wrote. He didn't explicitly mention the book, but people got the message. Comey's retort has been shared more than 100,000 times, making it twice as popular as Trump's original barb. Interest in Comey's tell-all — if indeed he does tell all about his interactions with Trump — has been building since last year. It has been available for pre-order for several months. Last month the publisher, Flatiron, moved the release date from May 1 to April 17, citing the public's demand to hear from Comey. Amazon isn't the only site that showed a surge of pre-order sales over the weekend. "A Higher Loyalty" was also No. 4 on the Barnes & Noble website's best selling books list on Sunday. Of course, getting on a best seller list a month before your book comes out is a dream come true for an author. The spike in sales is somewhat reminiscent of the interest in "Fire and Fury," Michael Wolff's controversial book about the first months of the Trump administration. The book jumped to No. 1 on Amazon when excerpts leaked out in January and stayed there when the president's lawyers tried to stop it from being published. The book has been at the top of The New York Times best selling books list ever since. The preorders for Comey's book indicate that it probably will also debut high up on The Times list. Comey will officially break his silence through an interview with ABC's George Stephanopoulos. The interview will air as a prime time special on Sunday, April 15, two days before the book reaches shelves. Comey is also scheduled to appear on "The Late Show" with Stephen Colbert, "The View" and other TV shows.